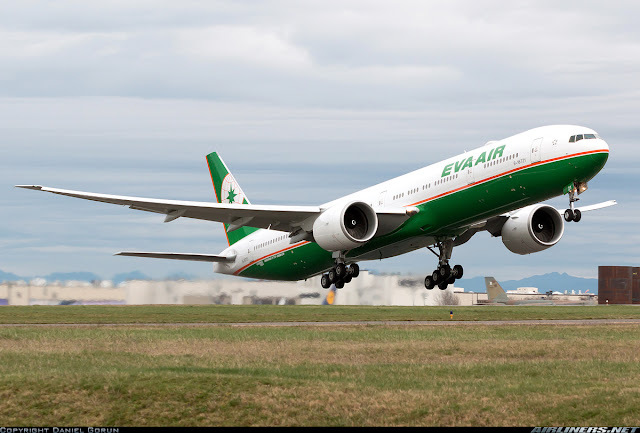 Welcome to my Trip Report on my favorite airline, EVA Air! When the airline announced that the Hello Kitty plane was to fly to Singapore and Houston with its 7th aircraft, I knew I had to get on board to experience this for my 3rd time. I have previously flown on the Hello Kitty, from Taipei to Hong Kong on B-16332 and B-16331. I wanted to do the inaugural flight which took place on the 21st June, but due to work commitment, I wasn't able to do so. I decided to go to Taipei in July to attend an event and that gave me a good excuse to fly on this beauty there. Once the dates were decided, I went to the airline's website to have a look at the prices. If the price was not good, my 2nd choice would be Tigerair Taiwan, a new airline for my flight logbook. Fortunately for me, I saw a good fare - S$572 for the WoW deal, I went for it, it was only $100 more than TigerAir Taiwan return and I can choose both normal 77W (Boeing 777-300ER) and Hello Kitty 77W flights. Only thing is I can't earn points for this booking. BR215/216 Taipei-Singapore 0925-1350 Singapore Taipei 1540-2000 (Tues, Wed, Fri and Sun) - (77A Configuration) Hello Kitty flights operate only Wed, Fri and Sun only. You can check out my post of Hello Kitty planes over here. This is the airline's Hello Kitty website, click here. * Airliners.net photos are credited to the respective photographers. As you can see, 77A has more seats than 77N so for the other Hello Kitty 77W aircraft, B-16703, it's unlikely you will see it here as it has the 77A configuration and is deployed to Paris. However, from time to time, you might see that aircraft flying on regional routes. B-16710 (Normal livery) - My first ride with this airline was on this aircraft. Do take note that the airline skipped the 4* registration. My experience with EVA Air's website and mobile app has been flawless. Not being bias here but after trying many airline's website and mobile application, this has to be the best one I used so far. With a good online connection, you are able to access to your flight booking and make changes such as seat assignment and meal selection, of course, if you want to make changes to your air ticket, make a phone call or a visit to the airline. My overall experience with this airline's website and mobile app was a very pleasant one, it has everything that a traveler needs to know and make changes when needed. One of the best among the airlines I have flown so far. WiFi is available only on the 77A aircraft. This airline offers 24 hours of online check-in, so you can use either the mobile app or the airline's website to choose your seat and complete the check-in. This will save time when you collect your boarding pass as there is a separate queue for it. It's nice to receive a text message regarding a change in my seat assignment. The airline has implemented a number of useful changes since my last flight with this airline (EVA Air's A321 HKG-TPE Sept 2014 trip report) and this is one of them. Do take note: aircraft change can take place at the last minute for operational reasons as stated clearly on the airline's website. So passengers cannot file a complain if they fail to fly the Hello Kitty aircraft. It happened a week ago when B-16720 substituted the Hello Kitty Jet as it went tech. I wanted the Hello Kitty Boarding Pass so I didn't bother using the barcode. A reminder message on that day of departure informing me about my flight. I did a check on the airline's past flights and realized that the day before, there was an evening flight to Houston and at that time I didn't know that the Hello Kitty aircraft operated only 3/4 weekly TPE-IAH (Houston) flights, so I panicked. I thought that this aircraft would fly on Tuesday evening to Houston and if it does, it would only return to Taipei on Thursday morning and my flight was on Wednesday afternoon, I went down to the office to get an answer but the staff had no clue. Finally, I went to the airline's Facebook page and the problem was solved. The Hello Kitty aircraft - B-16722 was not flying to Houston on Tuesday evening because that flight was to be operated by a non-Kitty Boeing 777-300ER and B-16721 did that flight to my relief. 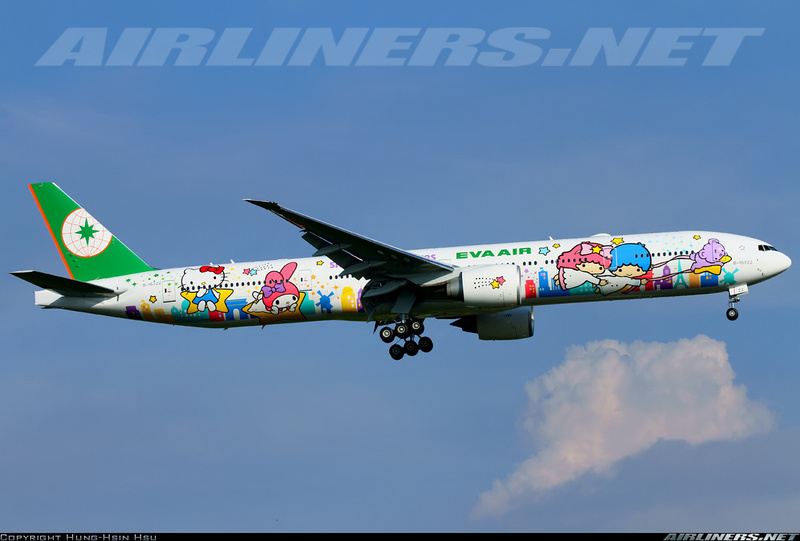 I am not a fan of Hello Kitty, but I want to add this special livery to my flight logbook and also to do a trip report on this. A day earlier at the airline's office, I took a few photos of the Hello Kitty plane and products. I was looking forward to getting the boarding pass. This airline is much more interesting than before. 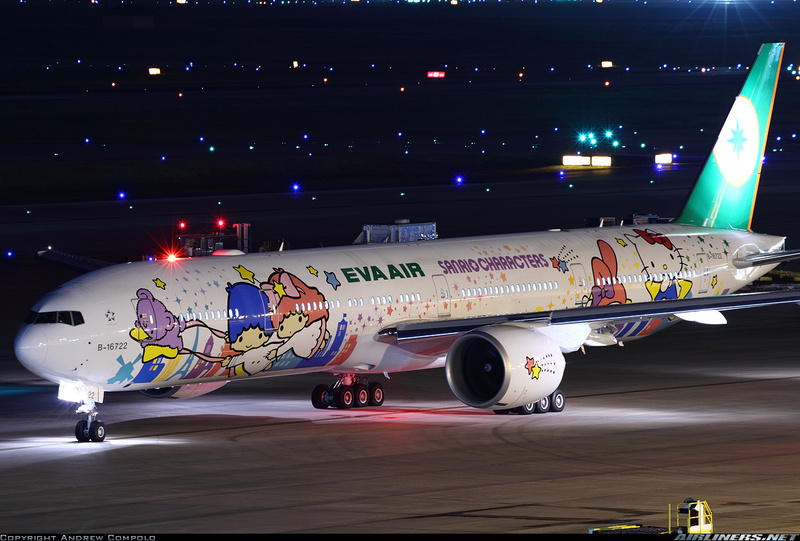 The model of the 7th Hello Kitty jet, "Shining Star" and I like this livery the best among the 7. 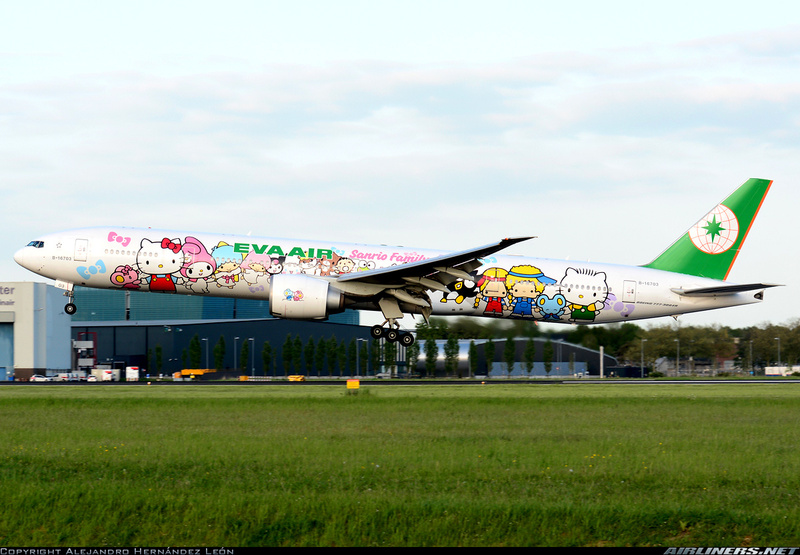 To check out the liveries of other Hello Kitty jets, do check out this trip report. The flight was at 1540 hours but I got to the airport early to hang around there until the departure time arrived. I had lunch at Aston and did some plane spotting at the viewing mall. Once that was done, I chilled out at the airside and waited for my aircraft to arrive. The earlier flight, BR225/226 was operated by 77N configured aircraft - B-16709. Prime Ribeye Xcut with Root Beer - Sadly, the standard has dropped. I asked for a medium cooked steak, it was poorly done. Most parts of it were medium rare. I didn't bother kicking a fuss and instead ate finish quickly and left. This was my first time flying with EVA Air at terminal 3. Previously it operated flights out of Terminal 1. Check-in row for EVA Air is row 8. I went there around 10.50 a.m and the check-in counter staff was surprised to see me checking in so early, she told me to return at noon time to receive the Hello Kitty Boarding pass if I want, so I did that. This was the check-in for the earlier flight, BR226. Later on, after my meal at Aston, I came back and got my boarding pass. Pretty, isn't it? Don't you like the interior of Terminal 3? Walking around the airside area. You can use any of these terminals for free. My flight was also departing from this gate. B-16709 was being prepared for departure. Soon, I saw it taxiing out for departure. I also saw the star alliance livery of Singapore Airlines. 9V-SWJ, a Boeing 777-300ER. I did a check on flightradar24 and B-16722 was on her way here. B-16722 and B-16709 "met up" briefly. Soon, I spotted it at the central apron. My gate was almost ready for boarding. Do remember to use the toilet or drink some water from the cooler before entering it. It turned out to be quite a full flight with many Taiwanese going home. The excitement of boarding the Hello Kitty was seen on some of the passengers' faces especially the little ones. Boarding was called by zones, from zone 1 to 4. Zone 4 is of course for the economy class passengers sitting near the rear. Managed to snap some shots from the gate. Can hardly see the livery though. Here are some more photos of this beauty, thanks to the respective photographers. I had to wait for a while before my turn came, by then it was quite crowded on board. I prefer to go early so that I have more time to take cabin shots, especially at the vacant seats. The excitement of walking through the aerobridge! What a beauty, isn't she? Once I was on board, that was it, I snapped as many as I could. The crew's uniform matches the cabin interior. The premium cabin certainly looks luxurious. It's a bit strange to see Hello Kitty pillow on it though. Configured in a comfortable 1-2-1 layout. I had a feeling of it briefly and find it to be quite comfortable. If you flying together with your partner, you won't be able to sit together with your partner. There is a private divider which can be raised after take off until before arrival. According to a friend, he finds this product one of the best he flew so far. I would choose 1-seater when traveling alone. Thanks to the friendly crew for allowing me to snap these photos and also one of them took a photo of me. Not a fan of Hello Kitty, but I was glad to be able to experience it once again for the 3rd time. Overall I find this product quite appealing, even though space looks limited. Do beware of the windowless seats - row 21 and 24. This cabin is in the 2-4-2 seating configuration. Is it worth paying more for it? For space and comfort, my answer is yes. No middle seat, isn't that good? The In-flight Entertainment system is similar to the Economy Class. The Elite Class on this aircraft is an improvement over the old one, you can click here to compare. The USB port, powerpoint and headset connection port are located at the handrest area, you need to bend forward in order to notice them. The new Elite Class seat is less wide than the old product. Legroom space looks decent, right? The remote control at the side of the hand rest. Comparing this to Air France's Premium Economy which I flew not too long ago before this flight, I find Air France's product more luxurious. I like this cabin a lot, not just the 3-3-3 seating configuration, also because of the seat color and is comfortable. The legroom space is adequate. The seat color and the colors of the headrest cover combine well. The cabin colors do match with the cabin crew's uniform. I reckon the little girl must be overwhelmed with the Hello Kitty stuff all over the place. This aircraft is quite long, took me a while before reaching my seat. The IFE system was free to use after the safety demonstration finished. The legroom space is around 32 inch, not too bad. I love the seat cover, what do you think? Once everyone settled down, we were pushed back and the wonderful noise of the GE 90-115B was heard, the vibration and noise caused a baby to cry! Once the engines were stabilized, that baby boy calmed down. While taxiing to the runway, a Taiwanese boy was throwing his tantrum and it was getting frustrating for me as the aircraft was reaching the threshold. Fortunately, he stopped just before we entered the runway. At this moment, the mother and daughter headed for the toilet. While they were gone, I took the opportunity to snap some photos of the cabin. Very nice cabin, right? Once I fly on this 77A, I don't want to fly on the 77N (Old cabin) even though there is better legroom space. Time flies fast and we were soon walking out of the aircraft. This good set of crew allowed me to snap some photos and even encourage me to check out the Premium Laural Class. How nice! Overall I like the Economy Class seats, its definitely one of the better ones in the market. I can definitely fly on this on the longer flights such as Taipei to Houston (14 hours), perhaps one day I might. The toilet is clean and has Hello Kitty toiletries items. So if you don't like Hello Kitty, you better not pick this flight. The service isn't as polished or outstanding as the Japanese and Korean carriers, but they were professional throughout, perhaps some level of stress caused them to freak out a little, handling a full load of passengers on this short hop. It would be a lot of worse if this was on TPE-HKG route. They emphasized a lot about not using electronic devices during takeoff and landing, that's not their fault of course, its the Taiwanese civil aviation that has to approve the usage of mobile phone or tablets in flight mode and from what I heard, this issue is being discussed right now, so hopefully we hear some good news about this. The flight crew only made his speech once and that's during the flight, welcoming us on board and giving us very brief updates. This also happened on my return flight. Seat belt sign was turned on and off a few times during the flight with the crew emphasizing on the importance of the fastening the seat belt during the turbulent period, but they were not very strict on it. Passengers were allowed to use the toilet as long as the turbulence wasn't bad, the crew was quite flexible with this. Overall, the crew was pretty decent and they were very accommodating to me when I photographed the cabin, thumbs up for that. The foldable tray, you need to unfold it in order to place your drink on it. Space should be enough for you to do to your work, and there is a power port located near your seat. An improvement over the old IFE system but there is still improvements to be made to make this even better. The best one I used so far has to be Air France's. I was pretty amazed at how user-friendly the new IFE system on when I flew it from CGK-SIN in May. Comparing this to Air France, this system loses out. The earpiece connector port and USB port are just below the left-hand side of the screen, this is the difference between Economy and Elite Class. A video of Taiwan Tourism was being played before the flight commenced. 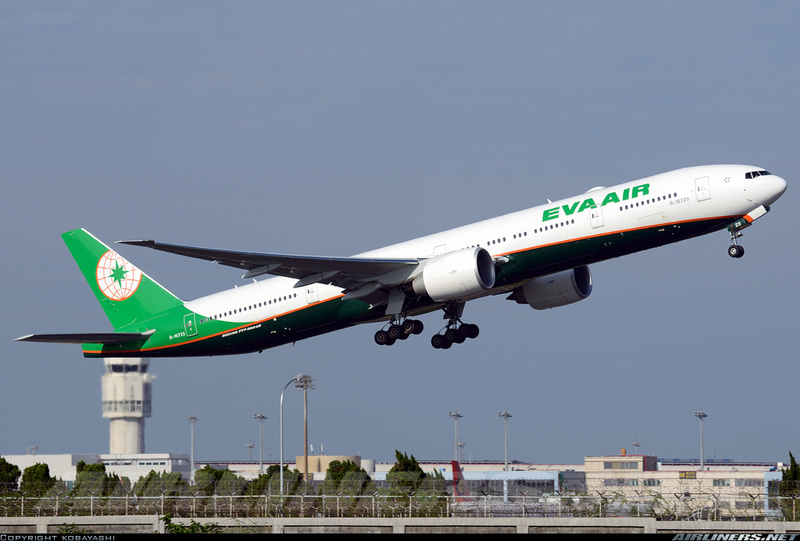 Welcome on board EVA Air! The touchscreen is responsive and the system overall is user-friendly. An overview of Changi Airport. The safety video is certainly eye-catching. The strict "No Electronic Devices" rule is still ongoing, hopefully, that will change in the near future. The in-flight map system which shows you a few different angles but you can't make adjust it. The system is operated by Panasonic. There is an in-flight meal menu, but I don't think many passengers would come across this on their screens, they would be too preoccupied with their entertainment programs. Checking out the latest movies played on this system. I decided to watch Avengers even though I caught it at the cinema. However after a few attempts, the system refused to play the movie, I tried watching other movies but to no avail. Seeing how busy the crew were, I decided not to voice out and instead tried my luck on the TV programme and it worked. Enjoying the flight map after finishing a few episodes of the drama series - forgot the name of it. It was nice to know where we were while flying at FL350. The flight at this point was slightly turbulent. Finally, I got my movie started and I enjoyed the 'Avengers' movie for an hour or so before landing commerced. The system also shows you the history from the start of the flight to the current position. Almost there now! The 4 hours plus flight came to an end. This has to be one of the fastest 4 hours flight I had experienced. Overall, the system could be further improved. Flight details should be shown when the movie is in the paused mode because the only way to check it out is to exit the program and that's not what the passengers want to do. What I like about the system is you can compile a list of your favorite movies and watch them at a later timing. The In-flight map could be more interactive for the passengers, like the one on Air France's new IFE system. Other than that, the airline has gotten itself a good entertainment system for the passengers, the contents may be limited but it should be able to keep the passengers entertained. The Boeing 777-300ER once again impressed me. The takeoff was powerful and I enjoyed the GE90 noise from the engine startup to the takeoff. Even when the aircraft went through bad turbulence, I was not worried at all. It is a steady aircraft, just like the Boeing 787 Dreamliner and I find them to be my preference over Airbus' long haul aircraft these days. The cabin noise may be noisy, but the headset that I used was enough to cover most of the noise so it wasn't that bad for me in this aspect. What's inside the seat pocket and on the seat? The small pillow - pretty nice, right? Even the disposal bag looks pretty. There is even a drink menu. In-flight magazine - there is a story about B-16722 in it. Some information on the airline's Hello Kitty fleet. Only 7 and there won't be anymore. The seat pocket was pretty full with these items in it. Before the hot meal was served, we were given a packet of nuts and a drink. Had a choice of Orange Juice, Apple Juice, and Water, I chose Orange Juice since it was closer to me than the others. About an hour later, the hot meal was served. There wasn't an in-flight menu so the staff explained the choices of food. After looking at the choices on the IFE system, I knew what I wanted. I had a choice between Chicken in Hunan Style or Braise Pork with Mustard Sauce and I choose the Chicken. Here is a photo of it, in 'Hello Kitty' style of course. You can bring home the cutleries. The food was average but it satisfied my stomach as I was hungry at that point. Nothing much to shout about this meal, but one thing for sure, I have tasted better ones. I chose the Taiwanese beer for my drink to celebrate my Hello Kitty flight. This is certainly not free and there is a package for it. Together with Deutsche mobile, it offers 3 choices. Unfortunately, you can't pause or transfer the remaining time to the next flight. Once you activate it, the timer starts counting down. I decided to give this a try and I forked out the U.S $12 for it. Do take note that the WiFi is only available after takeoff and before landing, there will be announcements for it. WiFi is not available at certain countries so when the aircraft passed by them, you will be notified and the Wifi will be cut off, but once you are out of that area, you can continue to use it, but the time loss for that period will not be compensated. This is the charges for the WiFi. I used my credit card to make the payment. Once that was done, I was online. You can fill in the details without the need of adding your number. I checked the speed of the connection - average. Initially, it was quite slow, but the speed picked up, later on, I was able to surf the normal social applications such as Facebook, Twitter, Instagram and also my favorite app, Flightradar24. I kept track of my aircraft's location. Without the flight crew's help, I was able to find out the routing. I don't see the need to use the WiFi on my future flights unless its work issues I need to settle asap. I don't think it is worth it especially when the plane enters an area which WiFi is not allowed to be used that means instead of enjoying it for 1 hour, you would be using less of it. Since the aircraft is equipped with an adequate In-flight Entertainment system, why not enjoy that and use the Facebook/Twitter/Whatsapp later. The wonderful GE-90 engines were started and soon we were on our way, with many stares looking at our aircraft as we taxied towards North Cross NC3 (Too bad for the spotters at the viewing mall) and soon found ourselves at runway 20C threshold. Passing by Singapore Airlines' Airbus A380, I wish this was 9V-SKI instead. 9V-SKI has the special livery to commemorate SG50. Passing by the central apron of Terminal 3. Spotted the Skyteam livery of Vietnam Airlines' Airbus A321 along the way. The Star Alliance of Singapore Airlines was spotted. Taxiing past the world's biggest A380 operator = Emirates! As there was an aircraft being towed along taxiway NC2, we had to use taxiway NC3. Passing by FedEx MD-11F and Druk Air Airbus A319. SilkAir's Airbus will soon be phased out in favor of Boeing 737s. Almost there now, I reckon both passengers and pilots of other aircraft having a good time looking at our aircraft. We were then cleared for takeoff, was expecting a bumpy takeoff. The takeoff was powerful and it wasn't that bumpy as I thought it would be. Making the usual turn to set our heading towards our destination, Taipei Taoyuan. Negotiating through some bad clouds, it was slightly bumpy. It wasn't very long after before we broke free from these fierce-looking clouds! Here we are, flying in the smooth and clear blue sky. That's what flying is all about. At some stages of the flight, even in good weather like this, we got ourselves some bumps along the way. Flying through clouds can be quite bumpy at times. Soon dusk came and it became dark not very long after. The descent and landing at Taipei were very smooth. The lights of the city appear and after a few quick turns, we were on final approach. Touched down on runway 06, Taipei Taoyuan Airport. It's so nice to be back here. The girl at the same row asked her mother whether we landed at the correct airport since she recognized Cathay Pacific and thought this was Hong Kong. How cute she is! With that, the engines were turned off and we waited for about 15 minutes before the queue to exit the aircraft started moving. I stayed behind to take some shots of the cabin before bidding the crew farewell. I am sure some of the Hello Kitty fanatics would go nuts when they see this. Exiting the aircraft after a fun 4 and a half hours on board the Hello Kitty aircraft. 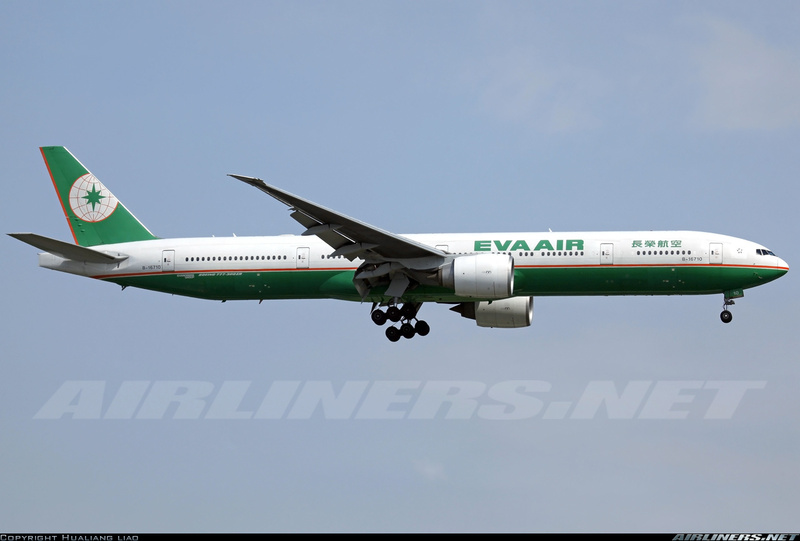 It is nice to fly on EVA Air once again, a personal favorite airline of mine. 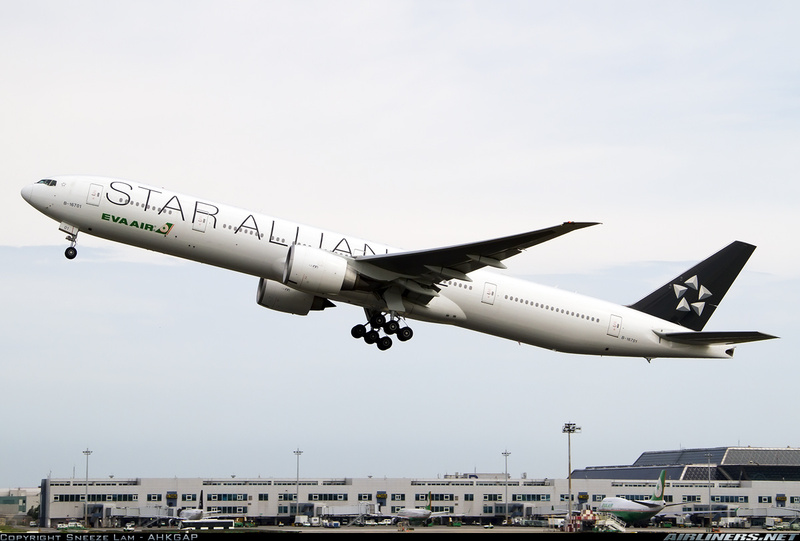 It has improved since the first time I flew with this carrier but there are of course improvements to be made to compete against with the top airlines in the world such as Cathay Pacific, Singapore Airlines, Asiana, Qatar Airways and a few others. I am not a fan of Hello Kitty but I flew because it was scheduled to do Taipei-Singapore route, the cabin was of the new type (77A) and also the airfare was cheap. I like the new products especially the Economy class, I feel that its a notch higher than the previous, the colors of the seat is eye-catching at least to me. As for the in-flight service, it's still not quite there yet comparing to the top airlines. The crew has to learn how to enjoy their jobs and express themselves more to passengers, rather than feeling stress, coping with the high load. Sanrio and EVA Air have certainly done very well in marketing, promoting the Hello Kitty Jet and for this, China Airlines haven't done anything to respond to this aggressive tactic from EVA Air. Perhaps they think that not everyone is fond of Hello Kitty and also the airline has better flight timings than its fiercest competitor, which in the sense is quite true. 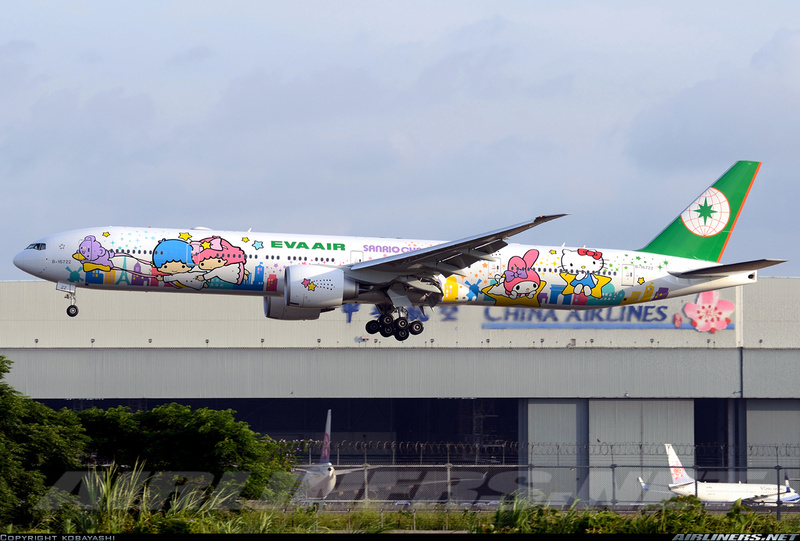 Overall, I recommend you to try out the Hello Kitty experience at least once and experience the new products from EVA Air. If you have enough mileage points or have money to spare, do try out the Premium Laurel Class, to Taipei or to the U.S. I am not being biased here, but this airline is certainly one of the better airlines out there. For my part 2- An unexpected operation upgrade to Elite Class on my return flight and more reviews on the in-flight service and products.